Hello! 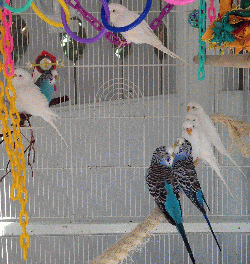 I`m Bessie, the turquoise-blue budgie in the middle front of this photo. A couple years ago, I was part of a flock that got attacked by mice, and because of that I am missing a foot. I am not able to perch and I need a special cage setup with platforms. I`m not very tame, but I could learn to be - I am friendly and smart, and I can brave when someone offers a treat on an outstretched hand. I eat Nutri-An cakes and leafy green vegetables.